We are proud to carry both the 2016 and 2017 Honda Pilot models. 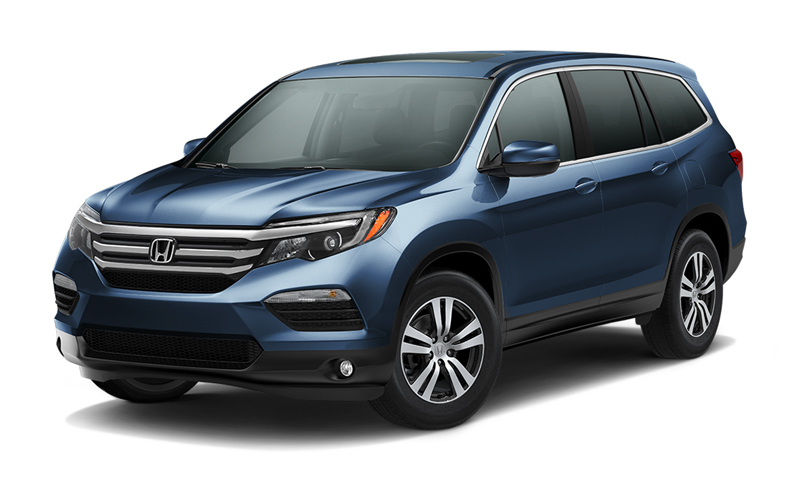 The 2017 Honda Pilot model has a few excellent updates but retains many of the impressive features from the 2016 model. Available in five trim levels, the 2017 Honda Pilot checks all of the boxes on most families’ SUV want list. Built for comfort, the Honda Pilot can comfortably seat as many as eight and has premium features throughout. From the market to the mall and everywhere in between, you’ll have all the space you need to fit your haul. Keep you and your entire family entertained with an available 8-in Display Audio Touch-Screen and a Rear Entertainment System while keeping them comfortable at the perfect temperature with the available independently-adjustable Tri-Zone Automatic Climate Control. Interested in learning more? Stop by Keyes Honda near Los Angeles, CA and our expert staff will walk you through the features and set you up for a test drive. We hope to see you soon! If you want to get your Jeep or truck done, this is the place to go! The staffs here are very friendly, knowledgeable, professional, helpful, and willing to answer your questions. They take care of your mercedes benz parts online vehicle very well…. Hi Dear, have you been certainly visiting this site daily, if that's the case you then will certainly get good knowledge gympros.com. Monopoly casino Roulette is also a classic game of chance which has been enjoyed for centuries. It's been around longer than Monopoly and it continues to intrigue new generations. When roulette and classic Monopoly come together, it's all about a fun theme and the ultimate in casino-style roulette action! This blog is fully fabulous in all aspects poker online. HOB filter owners should know that this filter should be cleaned once a month. The cleaning process is very simple. First of all, you will need fresh filtration media, a bucket, and a small pitcher. It might be a little bit difficult to install a wet/dry filter and a canister filter if you are doing this for the first time at www.fishtanksetups.com. When it comes to capturing an aerial footage, even for basic events, most people will either go for a helicopter or a drone. With drones being the most recent technology, it’s not so hard to see why they would offer more efficiency and time management more reviews at www.outstandingdrone.com . Hey to everyone, it’s my first visit of the blog site; this blog includes awesome and actually best info for the visitors. Taylor Benefits Insurance Agency Inc.
Shelton Roof covering noticed the rooftop in person and was able to rapidly figure out it had been within excellent shape, he or she chose to waive the charge More Bonuses. He seemed to be individual with the several hundred questions Gurus him regarding roofing supplies, care, etc. I would certainly suggest Shelton Roofing….